My verdict, having now seen these three beautiful films is much the same as Tarrs’ – that everyone should see them. There is a lot I could say about Jancsó’s framing of the Hungarian landscape, the despair and portrayal of absent morality – but this might not be adequate enough to persuade you to watch them (but of course I’ll try anyway). My Way Home follows the misadventures of a teenage Hungarian attempting to escape the oppressive regime of the Russian military. Falling in and out of freedom, our protagonist eventually ends up in the care of another young man tasked with farming dairy for the army in an area of land surrounded by mines. Despite their language barrier, a sense of compassion grows between the two, wrought out of their mutual captivity on the farm. My Way Home introduces Jancsó’s thematic preoccupations whilst presenting a sometime charming portrayal of unlikely friendship. The Round Up, however offers an entirely bleak perspective on humanity as prisoners of the Austrian occupation in Hungary in the mid-nineteenth century are arbitrarily treated with an almost total lack of dignity. The round up of the title refers to the collection of suspected members of a gang of resistance fighter’s lead by Sándor Rózsa, who are thought to be in the prison. Peeling individuals away from the group – the soldiers promise leniency if a prisoner can name someone who has killed more than they, hoping it will reveal allegiances and eventually the gang itself. 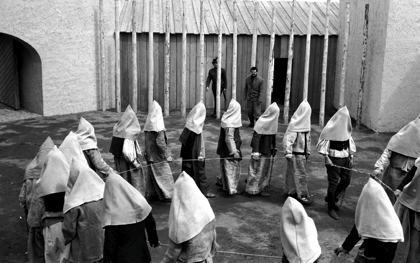 Jancsó handles the movement of characters like a slow dance or chess game, each moved here, there, backward and forward around the prison. 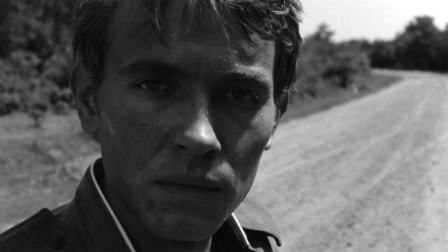 This drawn out game of sorts establishes the films tension but through lack of a use of close up, denies any emotional investment giving an overall mood of negativity. It is due to the masterful way that Jancsó directs that the film made such an impact in terms of innovation on its first release. The Red and the White is demonstrable most overtly of Jancsó as a political filmmaker. Detailing the fighting between the Hungarian volunteers who supported the ‘Red’ revolutionaries against the ‘White’ counter- revolutionaries, the film displays the wider implications of decisions made by the powerful over the weak, and how unstable and that power can be. These three films will stay with me; their images are hard to shake – for their tragedy, beauty, even for the occasional moments of humour but mostly for the unique and stunning vision of director Miklós Jancsó. Jancsós’ theme throughout these first extraordinary films is the fragility of humanity in the face of war, trauma and poverty. With such grand and serious ideas being dealt with – these are not beautiful films in a simple aesthetic way – they are beautifully about the human condition. Story isn’t everything, some of the best films are completely minimal, for example: Apichatpong Weerasethakul’s films evolve from the experience of the actors. Have you seen Gerry, by Gus van Sant? Nothing happens in that and its brilliant!